Two long-awaited Uptown street-beautification projects are poised to begin this summer after issues with their contractor delayed them from an expected spring start, officials said Monday afternoon. The $500,000 streetscape upgrades on the Freret commercial corridor are set to begin in June, and $2 million worth of similar work on South Claiborne is expected to start in August, Deputy Mayor Cedric Grant told City Councilwoman Stacy Head during a meeting of the city’s Public Works Committee. 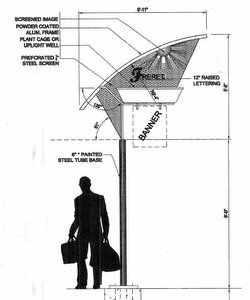 The streetscape project on Freret is intended to be the city’s contribution to the revitalization of the corridor between Jefferson and Napoleon avenues, adding more signage at the entrances to the corridor, planting trees, upgrading streetlights, repairing broken curbs and making the sidewalks more accessible to wheelchairs. The project was announced last August as part of the mayor’s “100 projects” and residents had been told to expect an April start, but that month came and went without any construction or explanation. In Monday’s meeting, Grant blamed delays in the street projects around the city on a number of factors, design delays, contract holdups, traffic studies and “coordination with community.” After the meeting, he said the Freret work in particular had stalled because of “compliance issues” with the contractor (Paschen, Nielson and Associates), but that the problems have been resolved and the project is back on track. 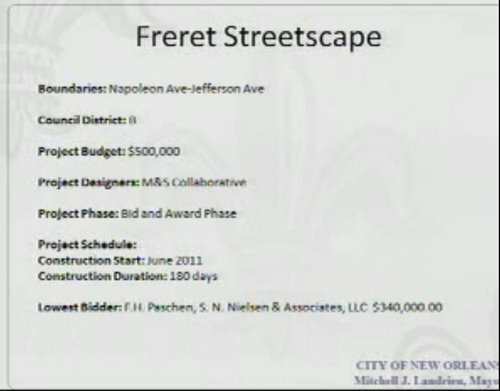 Construction on Freret is scheduled to take 180 days, according to Grant’s brief slide presentation, and South Claiborne (from Martin Luther King to Napoleon) should take 130 days, suggesting both could be finished by the end of the year if the projects stay on track. Head said after the meeting that she will seek another update in a public works committee meeting in July. “If by July they haven’t all started, the council will need to be aggressive,” Head said. The city's slide on the Freret streetscape. 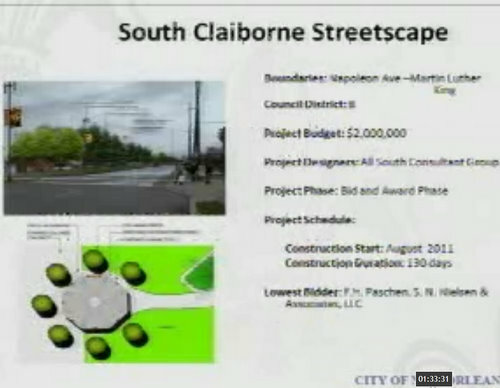 The slide for the Claiborne project. The full meeting also included discussion of parking-enforcement policies and the progress of the city’s pothole killer. Click in the box below for live coverage.